Donna, the "tractor photo" is one of my favorite Poodle photos of all time! 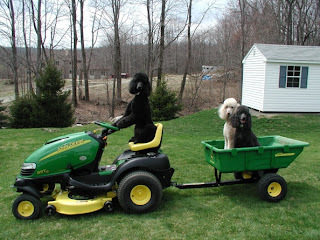 Who is the lovely dog driving the tractor in this photo? Donna: That was my "heart" dog...Jasper. He was truly one of those "once-in-a-lifetime" dogs. We were devastated to lose him to lymphosarcoma at the age of 5. it broke my heart. He was my first and only obedience dog at that time, and we were competing at Utility levels when he died. He had won 3 high in trials and several first places and other placements in various venues (AKC, UKC and ASCNE competitions). How I miss that boy. Jasper loved performing and was an all around athlete. Did you purchase him from a breeder or was he one of the dogs you rescued? Donna: Jasper was from a top show breeder, which made it hurt even more when we lost him at such a young age. We thought we were doing everything "right", as far as increasing our chances of obtaining a healthy dog that would be with us a long time. So your "free to a good home" Poodle has been one of your healthiest Poodles thus far? That must have been incredibly hard, losing such a special dog at such a young age. Can you tell us about your white Standard, is this Tyler, in the beautiful head shot? Donna: Yes, that is Tyler in the headstudy, and he is also the white dog in the photo of the 3 Standards sitting together on the rock. Tyler was going to be the dog that helped me heal from Jasper's loss. His AKC name is Trebert's Time to Heel...with heel standing not only for heeling as in the sport of obedience, but also for "heal", as in helping to heal my broken heart. I was planning to carry on, with Tyler, the dog sports that I had fallen in love with when I was competing with Jasper. Sadly, it wasn't meant to be. What happened with Tyler, that he could not be your next competition dog? Donna: Tyler is 5 years old and unfortunately he was diagnosed with Addison's disease at the tender age of six months. We almost lost him before his diagnosis, as four different vets hadn't a clue as to what was wrong with him. According to the text books, Addisons normally appears in middle age to older dogs, not in young puppies. It simply wasn't something they were looking for in a puppy. A trip to Angell Memorial on Christmas Eve with a very sick puppy is when we finally got answers. But I believe you told me that you have experienced more than just Addison's with Tyler? Donna: Yes, unfortunately, we have also experienced gastric torsion (bloat) with Tyler but he made it through that surgery. Last year Tyler was also diagnosed with PRA (Progressive Retinal Atrophy) by a canine ophthalmologist. I suspected something was wrong quite some time ago, because he would have difficulties locating a piece of food or a toy that had been tossed a few feet away from his body when I would practice recalls. So now we are working with commands (step up, step down, left, right) to help him navigate when he becomes totally blind. I hate to hear that you have gone through so much with Tyler's health, especially since he was the dog who was going to replace Jasper as your next obedience dog. Donna: Yes, it has been very stressful,, but at this point we are just glad we still have him with us. Tyler would have made a wonderful obedience dog, as he is smart as a whip, but since it is very important to keep stress (even happy stress like dog training classes) to a minimum with an Addisonian, I have chosen not to compete with him. Actually now that he has been diagnosed with PRA it's a good thing I did not pursue dog sports. He is a lovable little guy, my constant shadow, and always showering me with kisses. Like Jasper, Tyler did come from a top show breeder, so it has been very disappointing for him to have so many health issues. 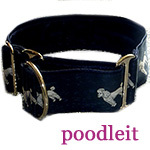 How long have you been in Poodles? Have you ever been a breeder? Donna: No, we have never been breeders. We got our first in 1989.
Who is the pretty apricot Poodle in the photos? Donna: Teddy, our apricot boy, came to us due to an ad in our local newspaper that read "free to good home". He was ten months old at the time, and he celebrated his tenth birthday with us this year. Donna: Yes, believe it or not! He is such a goofball. His funniest moment was when I stopped to take a phone call while taking clothes out of my washing machine. I heard a noise behind me and there was Teddy, doing a somersault into my laundry basket. What a sight! The basket was on its side and there he was upside-down with wet clothes hanging off his body. Never a dull moment with our Teddybear, that's for sure. I noticed a familiar name while reading through the poodles that were entered in the online Poodle Health Registry. One of the dogs who was registered as having Addison's Disease has the same sire as my Teddy does, so I know it is in his lines. Fortunately for us, it has not shown up with Teddy. .
What about the black dog in the photo of the three sitting together on the rock, wasn't he another dog that you titled in obedience? Donna: Yes, that was Mickey, our rescued Poodle. We lost him suddenly a few years ago at the age of 10. He had his CD title with AKC and was a registered therapy dog with Therapy Dogs International. He was so aloof with strangers that I chose not to do much along those lines since he didn't seem to enjoy it. He was a wonderful dog and liked nothing better than to curl up in our laps. No one wanted to adopt him way back when (he also came to us around 10 months of age) because he refused to look at them. He was very bonded to us and with lots of love and hard work he opened those gorgeous eyes for everyone to see and became a favorite among our friends. All of our boys are very special to us. Donna, do you have any advice you could offer, to people who want to purchase a Standard Poodle? Do you have strong feelings about things like outcrossing and genetic diversity, do you think that increases the chances of producing dogs that will grow up to be healthy? It's difficult for me to answer this question as I don't have the knowledge to know what a breeder should know in order to produce healthy dogs. We simply trusted that with the high dollar amount that we have paid for our dogs (the ones who came from show breeders) that they, the breeders, would have invested their time and money in researching such things to produce not only dogs that are beautiful on the outside but the inside as well....emotionally and physically. One thing I will say....when owners of dogs call the breeders to tell them of specific illnesses that our dogs have been diagnosed with...please share that information immediately to the owners of their litter mates. The symptoms for Addisons especially can come and go over time, but then the day comes when your dog goes into a crisis. If your puppy buyers know it's in the lines they can inform their veterinarian immediately. Time can be of the essence,--very important to get the diagnosis and proper medication quickly in order to save the dog's life.. 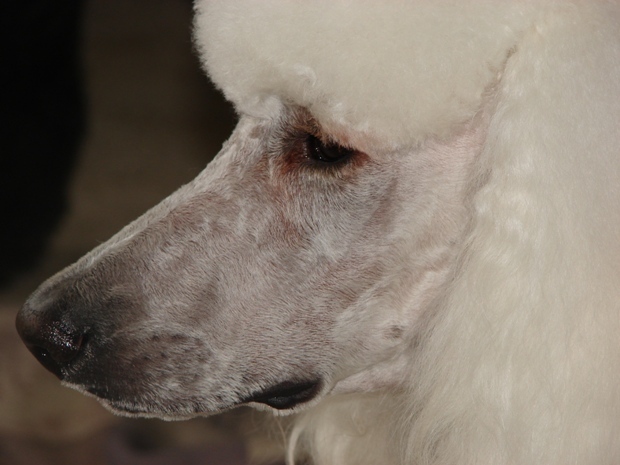 The only definitive test for Addisons is the ACTH test so Poodles owners need to be aware of that as well. We are so thankful to have our "special needs" boy Tyler (forgot to mention his high liver values and incontinence) still with us. Even though his medical care has drained our pocketbooks and changed our lifestyle we hope we have many more years with this sweet little boy. Thank you so much Donna, for taking the time to talk with me about your dogs. Any final words you would like to share with our readers? 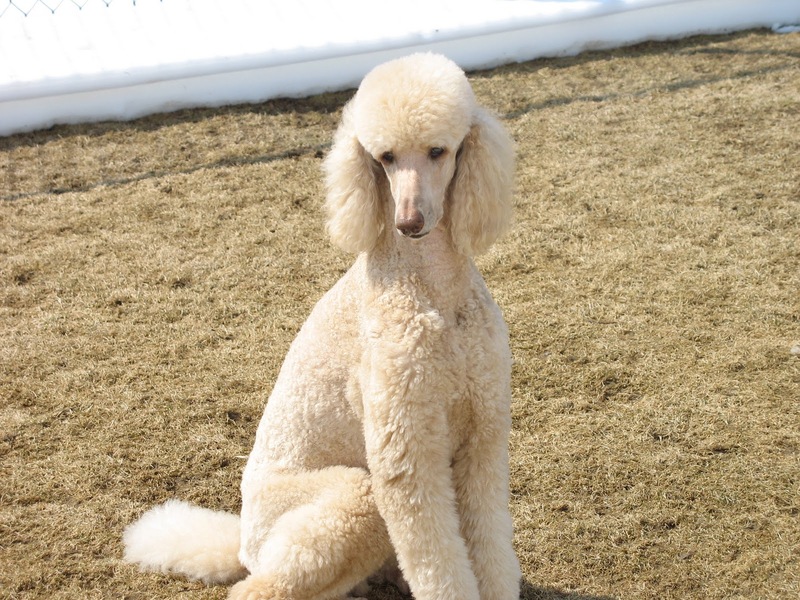 Donnna: Before I sign off I must tell you that our love for this breed all started with a truly wonderful Standard poodle named Charlie that we purchased back in 1989. Wish I had known about TDI at the time as he would have been an excellent therapy dog. He was the best! Beautiful inside and out and we had ten amazing years with him. How I would have loved to have had more years with Charlie. 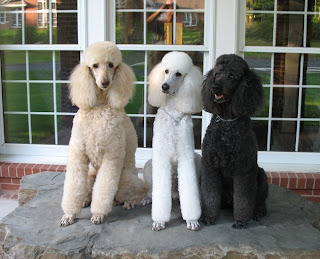 My husband tells everyone that we have added four more poodles to our home just trying to replace him. As everyone knows there are similarities but those special ones can never be replaced. 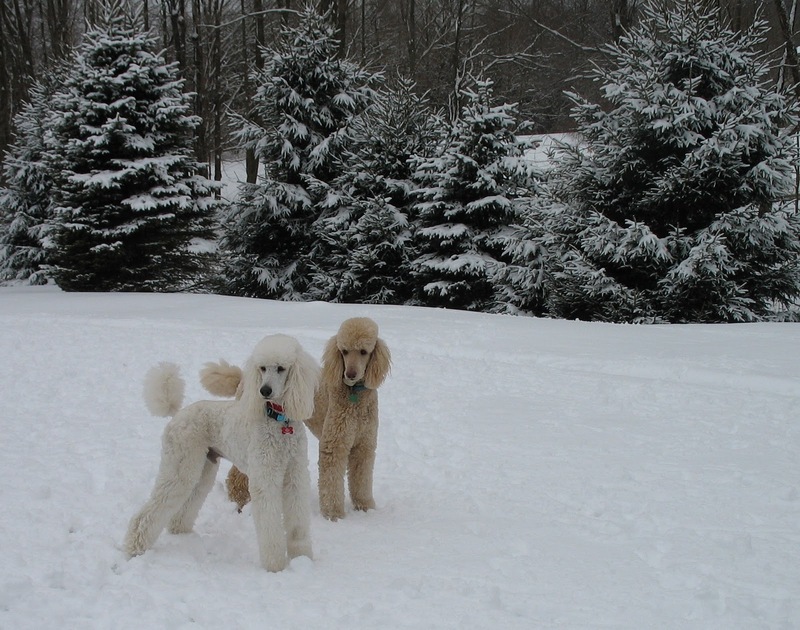 I certainly hope Standard poodle breeders will dig deeper into health issues , and will try to produce dogs with longer, healthier lives so we can add more of these wonderful creatures to our family in the years to come. With the problems we have experienced, I truly fear for this breed we love. Thank you Donna for sharing the stories of your dogs. 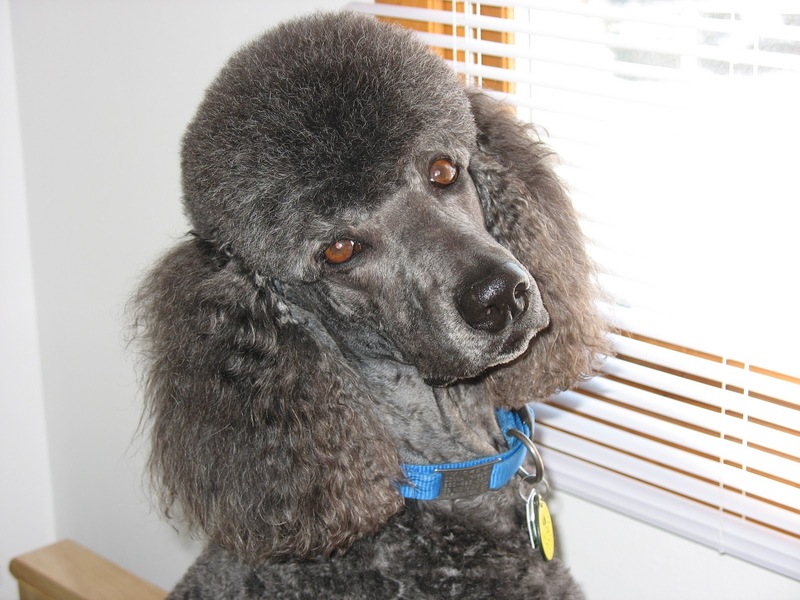 I'm sure our readers can better understand the tragedy of Poodle health problems when they hear about our special dogs that have brought us not only joy, but sometimes deep heartaches, due to their health issues. Thanks so much for sharing your story! I know exacty how it feels to loose a cherished companion long before their time....the heartache, disbelief, and sadness can be overwhelming. I am however glad to hear that despite all of the issues you have encountered you still posses love and devotion for the breed. Your poodle family is so lucky to have found you and Im sure in return they have added a lifetime of happiness. Our 7 year old Red Standard, Fritzy, had some type of myositis (masticular maybe) treated by large amounts of prednisone and blew out his ACL. He came from a top breeder. He just passed away this week swiftly and mercifully. So by tracking the dam/sire lines, do you think we could have foreseen these ailments? Maybe just by looking at the shape of the rear knee (straightness), we might have predicted knee problems? Any advice as we are about to look for a new poodle and Fritzy was our first...Thank you! Hi Kitkat, I am sad to hear of the loss of your boy at such a young age. I know that must have been unexpected, as we lost an 8 year old a few years ago to lymphoma, and we were shocked to lose her that early. I don't really see torn ACLs as a hereditary problem so no, I doubt you could have predicted this. It is something that happens in all breeds and in mixed breed dogs, and to dogs of all ages. I have had it happen twice, once to a 6 month old and another time to a 13 year old dog, both Siberian Huskies. Both recovered fine after their surgeries. As far as looking for a new Standard pup, you can research some health problems if you google the Poodle Health Registry. For example, this is how I discovered that my current Standard had a littermate with Addison's disease, another who bloated. Bloat is more common in males, especially those with deep chests. We have had one Standard Poodle bloat, but he lived through his surgery. Bloat is actually in most all of the bloodlines, but I think some of the older lines of black Poodles (Wycliffe) have more incidences of it than other lines. Our Standard girl is 9 years old now, and is having some health problems, so we are thinking ahead as to what we would like in the future. We have owned several Standards and we LOVE the breed, but we are thinking of perhaps getting a miniature, from show lines so that he or she would be on the larger side, as our next Poodle. In Europe there is a size that is between a Miniature and a Standard, called Moyens. They are in the 16-20 inch (at the shoulder) size. There are a few breeders here in the US that are now trying to develop this size, even though they are not a size that could be shown in AKC shows at this time. I think the most important thing is to choose a breeder whom you trust.If you are considering a puppy from an upcoming litter, just bluntly ask them what hereditary problems are most common in those lines. 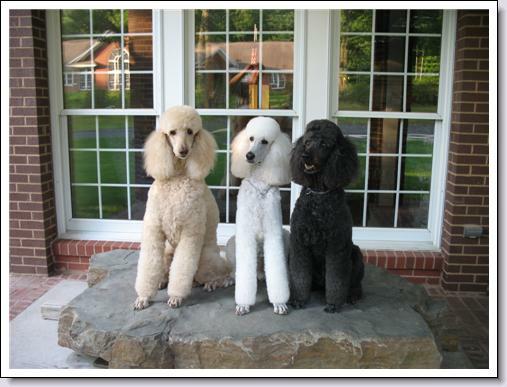 If they say "nothing" then they either have had very few litters of Standard Poodles, or they are not telling the truth! Unfortunately our beloved breed has many problems. And there are problems in miniatures and toys as well, it is just that the problems are different (for example bloat is not nearly as common in smaller dogs). Please keep in touch and would love to hear of any suggestions about things you would like to see on this blog. I am a dog trainer, and have many training articles on the blog that is associated with my www.knowingdogs.com website, but I am still trying to build readership for this blog. Since I am a trainer, not a breeder, my readers are most often companion dog owners, not people who are showing Poodles. You can also feel free to email me anytime at knowingdogs@yahoo.com.